Bring the nature in with our Branch stencils and large Tree stencils! Try our reusable Tree and Branch Stencil designs to quickly and easily decorate your walls, furniture and fabric. 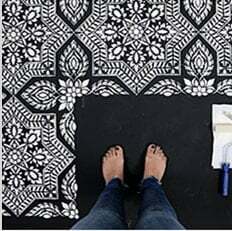 These large stencils are versatile and easy to use! If you love the look of vinyl wall decals but dislike the idea of putting tacky stickers on your walls, our large tree stencils and branch designs are just what you've been looking for. Not only these are reusable stencils, and not one-time use stickers, but they also give you the flexibility of choosing any paint color you want to customize your decor. And it's so much more fun to create your own hand-painted wall art instead of merely applying a sticker. You can also create amazing branch wallpaper patterns by overlapping the branch stencil and varying your colors. Tree designs bring calmness, serenity and beauty into your space. Create a peaceful zen bedroom retreat or a relaxing spa bath with a touch of nature by adding some weeping tree branches and blooming boughs around your bed or a bath tub. Our stencils are of highest quality and easy to use, even beginners get great results! Please watch our How To Stencil Videos to learn a simple stenciling technique and try a tree stencil for your next home decorating project.